Knowing how to listen is essential to learning, growing, and getting along with others. This gentle, encouraging book introduces and explains what listening means, why it's important, and how to listen well. Realistic examples and inviting full-color illustrations bring the concepts to life. The focus throughout is on the positive results of being a good listener. Made to be read aloud, this book also includes a special section for adults, with ways to reinforce the skills being taught, questions to invite lively discussion, and listening games to play. 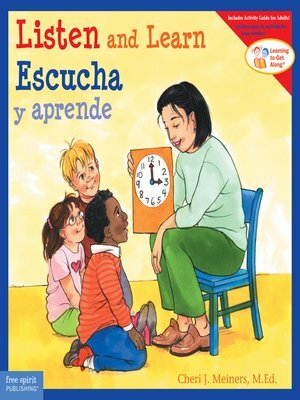 Now children and adults can enjoy our most popular Learning to Get Along books in English and Spanish. The series helps children learn, understand, and practice basic emotional and social skills. Real-life situations, lots of diversity, and concrete examples make these read-aloud books appropriate for all homes, childcare settings, and primary classrooms as well as special education, including settings with children on the autism spectrum. Presented in a social story format, each of the bilingual Learning to Get Along books includes a special bilingual section for adults, with discussion questions, games, activities, and tips that reinforce improving social skills.